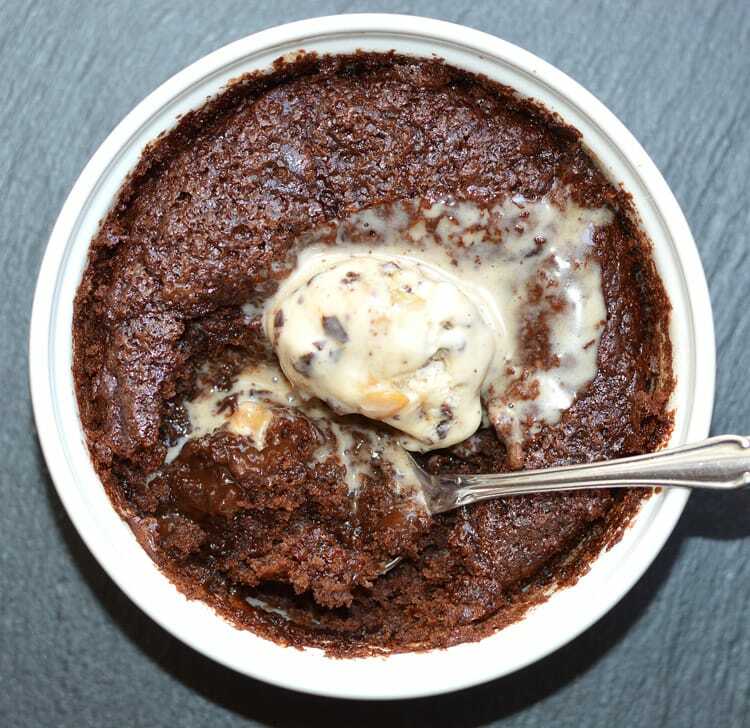 Our Vegan Hot Fudge Pudding Cake was inspired by an old Hershey’s recipe and surprisingly, required few substitutions as it contained no eggs. 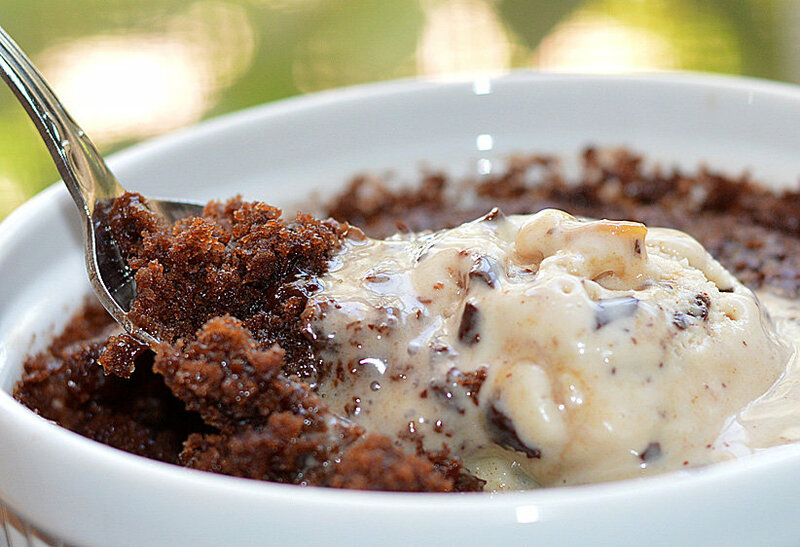 You know those oh-so-popular molten chocolate lava cakes? It’s very similar but in my honest opinion, SO much better. The best part is that you can control how molten it gets by altering the baking time. I actually use these larger, 1 C individual oven-safe baking ramekins because who wants to share? Not me. Nope. As a self-proclaimed chocoholic, this one has my name written alllll over it! 🙂 And that is vegan ice cream you are looking at. Anyone can top this dessert with vanilla ice cream, but not me. I sent it over the top with Cashew Salted Caramel Cluster by So Delicious. If you haven’t tried this yet, you are seriously missing out! When I read the original recipe, the method was really unique and unlike any cake recipe I had ever experienced before. The fudge-like base goes down first and has the consistency of a brownie batter. On top of that, a cocoa powder, sugar and brown sugar mixture. Lastly, hot water is poured over the top and you must not stir. Interesting, right? This dessert cooks for nearly 35-40 minutes (or until the center is just set) after which time the top layer is now cake-like and a bit crusty from all of that sugar and the center is an ooey-gooey hot fudge. I allowed it to cool for a few minutes (because it comes out bubbling hot) and then topped with my Salted Caramel Cluster ice cream. Mind. Blown! 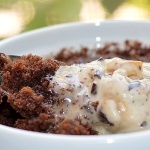 If you make this Vegan Hot Fudge Pudding Cake, let me know what you think in the comment section below. You can also tag me on Instagram @theveglife with a photo of your creation. I always love seeing what you come up with. Heat oven to 350°F. Combine dry ingredients for the fudge layer. Stir in almond milk, vegan butter and vanilla; beat until smooth. Spread batter in ungreased baking ramekins. Stir together the topping ingredients and sprinkle mixture evenly over batter. Pour the hot water on top and DO NOT STIR. Bake 30 to 40 minutes or until center is almost set. Remove from oven; let cool for about 15 minutes. Makes 2 (1 cup) or 4 (1/2 cup) servings. When do you add the hot water? I made this to-day for a treat for my husband and I, served it with fresh berries. FABULOUS! So, thank you. I think this recipe is fabulous! I would just add one little correction to the recipe, however. I do not think this recipe makes four 1-cup servings. I think it is for a single serving???? ?